We’ve all been to at least one wedding where the wait between ceremony and reception has seemed never-ending. One way to combat boredom for your family and friends on your own big day is to arrange some entertainment. 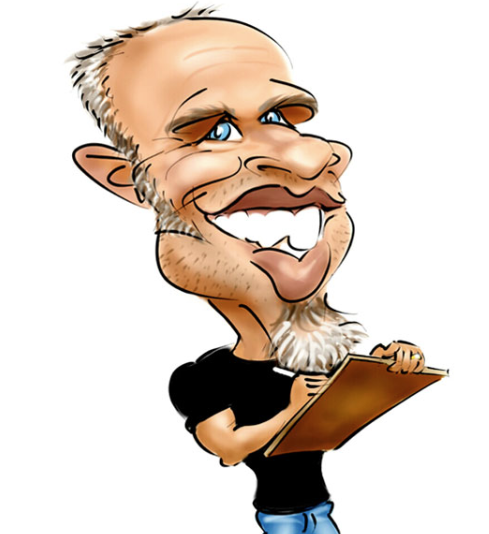 Caricaturist Peter Mascher is a pro at keeping your guests busy and smiling during the in-between moments. His novel sketches are not only a unique ice breaker but also a funny keepsake your guests will cherish for years to come. I studied fine art at the Witwatersrand Technicon in Johannesburg then worked as an editorial cartoonist for ten years for Beeld, Citizen and Daily Dispatch newspapers. When I moved to Cape Town I began freelancing. Currently I focus on drawing live caricatures at ‘gigs’ which mainly consist of weddings. I am a one-man-band but will sometimes work together with other caricature artists if a big turnout of caricatures is needed in a short amount of time. If I am not drawing at gigs I am doing caricature commissions or woodwork at home. I’ve been drawing caricatures for 23 years. For the last seven of those I have done mainly live drawing. I charge R1100 per hour for live drawing or R5500 per evening. It takes me 5 minutes to draw a person live in black and white. Private commissions for full colour head and shoulders start at R650. I’ve done exactly 50 weddings to date. My business has grown steadily from just one wedding in 2013 to 17 and counting for 2019. Unfortunately there are only so many weekends and public holidays in a year. Whoever pays their 50% deposit first gets the booking. My biggest challenge is marketing myself. I have to get to grips with all my social media handles! The scarcity of live caricature drawing makes it special. Drawing live caricatures is a great ice breaker creating laughter and a light-hearted, fun atmosphere. The best part is that the guests get a personal souvenir to remember the big day. I provide both entertainment at the wedding and a wedding favour for the guests to take home at the same time. The wedding that comes to mind is the most recent one I did. I was booked for four hours but seven hours later I was still drawing as people had just not stopped coming! The couple were glad to offer the extra R1000 to extend to the full evening package. Over the course of my career there have been one or two weddings that I could not wait to leave. This was because at these weddings nobody knew about my service and I could just not get going properly – very unsatisfying. Be sure to make sure your guests know what is on offer at your wedding. Have your MC communicate the entertainment. At most weddings I start drawing during the canapés and don’t stop until the wedding is over – just the way I like it.